Sega's Astro Blaster is one of the earlier multi-stage space shoot-em-up games. You must guide your ship through many waves of different attacking aliens, periodically docking with your mothership to replenish your fuel tanks. Your ship is equipped with a laser, and each time you fire its temperature increases. If it moves into the red, you can't shoot, and must wait for it to cool down. The aliens attack in formations, all with a predefined movement pattern. Some move across the screen, while some move straight down, and others follow more complicated routes, spinning and moving around in figure of eight patterns. Some move very slowly, whereas some move quickly. You must destroy all of the atttacking formation to advance to the next stage. If a ship passes by you and moves off the bottom of the scren, it will reappear at the top. All the time you are playing your fuel level is steadily decreasing, so you can't afford to let too many ships pass by, as all time wasted costs extra fuel. 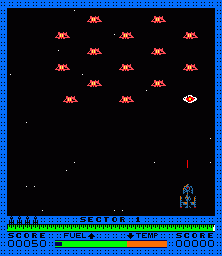 The stages of attacking aliens are also interspersed with other stages where you must destroy/avoid asteroids as you move forwards through an asteroid field. You don't have to destroy all the rocks on this screen, simply get through them all. 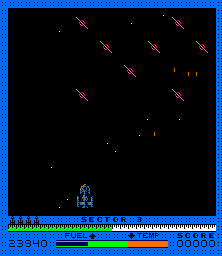 There are also stages where you must destroy missiles falling diagonally down the screen. On these stages you must destroy all the missiles. Secret bonuses are awarded for various accomplishments, such as surviving the asteroid fiield, or clearing an attack wave without missing a shot. You can either start with two or four lives. Scoring Sector 1 Aliens: 50, 60 or 70 points. Sector 2 Aliens: 70, 80 or 90 points. 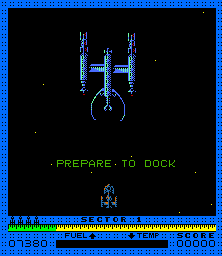 Sector 3 Onwards: 70 - 110 points. Bonus points are awarded after docking for remaining fuel. Secret Bonuses: 200 - 1,000 points. Try to time your shots carefully, and don't waste too many shots by firing too rapidly. You need to always be able to fire two shots in rapid succession, so don't allow your laser to overheat.